Super high ratings, a fantastic price, and plant-based ingredients make this our favorite. Super high ratings, a fantastic price, and an effective mix of ingredient make this our favorite. If you need fast treatment on your pet, this spray destroys fleas and ticks on the spot. With the potential for several illnesses and allergic dermatitis, fleas and ticks pose more risk than itching and annoyance alone. Fleas and ticks present some severe health risks such various types of fevers, Lyme disease, and plague to both you and your pet. Yes, the bubonic plague is still present in the world today, even the United States, and it can be transmitted by flea bites. Once a flea infestation enters your house or apartment, it can be an unnerving job to get rid of them. Rather than dealing with ectoparasites biting you and your pet, or risk contracting illnesses that could make your cat or dog ill or even land you in the hospital, we’ve rounded up the best flea prevention products for you and your pets. 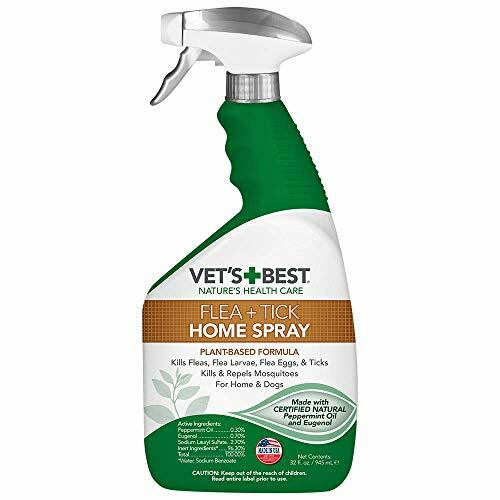 Vet’s Best Flea and Tick Home Spray is a great all-natural product to use on your dogs and around the home to both treat and prevent fleas, ticks and mosquitoes. The spray is made from essential oils, so it has a pleasant smell around your home and is safe for your pets. The bottle comes in a variety of purchasing options to meet your needs. Go for the discounted 2-pack if you have a larger house and multiple pets, or the 96 oz refill bottle to make sure your pets are protected long-term. Can treat up to 2,000 square feet. Prevents reinfestation for up to roughly seven months. No lingering odor or overpowering scent. Do not have to vacate area for several hours. Almost 80 percent of reviews are five stars. Some customers found it ineffective. Safe for hard surfaces and carpet. Not for use directly on pets or animals. Wear gloves and filter mask in ventilated area during use. Each can contain 16 ounces. Active ingredients: (S)-Methoprene, Permethrin, Phenothrin, N-Octyl Bicycloheptene Bicarboximide, and Piperonyl Butoxide. 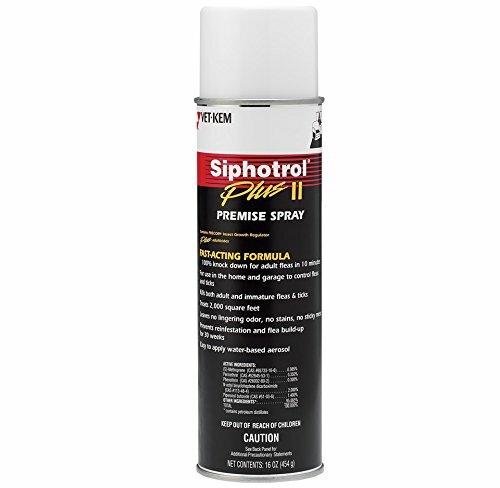 Vet Kem Siphotrol Plus II Premise Pest Control Spray contains the powerful ingredient PRECOR Insect Growth Regulator. This formula is stated to have a 100 percent kill rate for adult fleas. Better yet, it works destroys pests in only 10 minutes. Effective up to two months with proper use. For both cats and dogs. Reasonably priced for use on smaller animals (more needed for larger dogs). Can be sprayed onto fur and massaged on your pet. Some animals, especially smaller ones, can have adverse reactions. Spot test on your animal before coating their body. Available in 14-ounce and 16-ounce bottles. The dose is about four trigger sprays per pound of animal body weight. Always avoid spraying near eyes and mouth or directly onto pet’s face. Active ingredients: Etofenprox, S-Methoprene, and Piperonyl Butoxide. 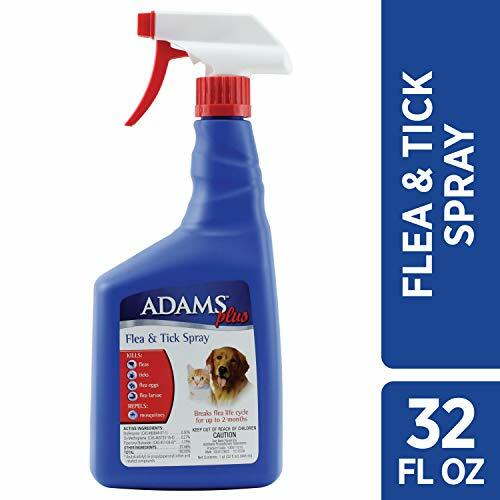 Adams Plus Flea and Tick Spray kills adult fleas, their eggs, their larvae, and ticks, too. This spray also repels mosquitoes. If the flea eggs and larvae are sprayed with Adams Plus Spray, they cannot grow into biting adults, thanks to a growth inhibitor. This flea and tick spray blends the adult flea killing ingredient of etofenprox with the long-lasting egg-destroying ingredient of S-Methoprene Insect Growth Regulator. This combination of flea treatments delivers rapid success from both biting fleas and ongoing treatment of eggs. The container is 96 ounces or ¾ gallon. Kills fleas, ticks, mosquitos, palmetto bugs, ants, cockroaches, centipedes, and more. Can be used indoors, too. Excellent for potent use around perimeter of buildings and in gravel or mulch. 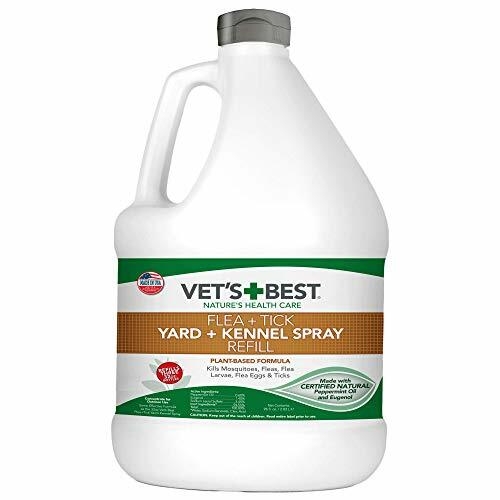 Vet’s Best Flea and Tick Yard and Kennel Spray can be used around the whole family and works best when used routinely to keep not only fleas and ticks away but mosquitoes too. One bottle can cover up to 5,000 square feet and comes with a sprayer already attached to the bottle so all you have to do is attach the hose and go. It works better if you reapply every two weeks to keep the pests away. Non-staining for all sorts of rugs and carpet. Kills both fleas and ticks. Works for up to seven months. Covers up to 2,100 square feet. Has exceptionally high customer ratings. Ineffective for customers in some regions. Not for use directly on pets or skin. Keep people and animals out of the area until thoroughly dry. Active ingredients: Pyriproxyfen, Tetramethrin, and Phenothrin. Knockout E.S. Area Treatment Carpet Spray contains an insect growth regulator that destroys active flea infestations and prevents reinfestation for up to seven months. Covers up to 2,100 square feet. This spray can be used in kennels when pets are removed, cars, interiors, but is especially useful for carpeting. Fleas pose numerous health risks. They’re a surprising channel of some severe illnesses. Pyrethroids are a form of man-made pesticides comparable to the natural pesticide pyrethrum or pyrethrins. Tetramethrin is a potent synthetic pesticide within the pyrethroid family. Phenothrin is an insecticide that is also lumped in the pyrethroid family. Phenothrin can destroy insects via direct contact or by insects ingesting it. This pesticide disrupts their normal nervous system functioning. Etofenprox is a man-made pyrethroid which that disrupts nerve impulses in insect nerve axons and was proven highly effective even in tropical environments. Bifenthrin is yet another insecticide within the pyrethroid family. Bifenthrin affects the nervous system of insects when pests eat or touch it. Bifenthrin is more toxic to insects than to people because insects maintain lower body temperatures and, naturally, have a smaller body size. Pyriproxyfen performs like a hormone in insects and disrupts their growth. It’s an insect growth regulator that affects mostly larvae and the eggs. Piperonyl butoxide is a man-made pesticide that does nothing alone but operates with other insecticides to enhance their effectiveness. Fleas pose numerous health risks. They’re a surprising channel of some severe illnesses. You can often see a tiny reddened spot encircled by a red halo, often without much swelling when you encounter fleabites. Persistent scratching can lead to patches of hair loss or broken skin. If the fleas fed off of infected rats, in some areas, they even pose the threat of plague. That’s correct, the bubonic plague many people think is ancient history is still active today. In some parts of the world, it’s experiencing a resurgence because of infected fleas. Even in the United States, places such as Colorado, Arizona, and New Mexico have plague-carrying fleas. Once fleas enter your house or apartment, entirely destroying them requires an intensive program to rid the infestation. Eradicating your place of fleas necessitates steps that include daily vacuuming, eliminating the pests on your pets with medicines and shampoos, and if needed, treating outdoor areas where your pets spend time. There are several diseases associated with ticks, not just for your pet but also for you and your family. Rocky Mountain Spotted Fever can be transferred through tick bites. Symptoms of RMSF are excessive fatigue, sluggishness, and, of course, high fever. More commonly, ticks are known for carrying and transmitting Lyme disease. Lyme disease is also contracted through tick bites and can become chronic. Symptoms of Lyme disease include fever, exhaustion, severe headaches, and rash. Ticks can be right in your own backyard. Installing in a barrier between your lawn and any forested spots can help prevent ticks from moving into your yard. Gravel, a pebble moat, or mulch can be spread between woodlands and your property to minimize tick migration. Treating your yard with tick-repellant sprays or powders is an additional safety measure that’s easy and well worth the effort.